ReEntry Rehabilitation : ReEntry Rehabilitations Services, Inc.
ReEntry Rehabilitation Services, Inc. was established in 1978 to provide rehabilitation services in the private sector. We deal with vocational and disability issues in a broad range of programs and settings. Our goal is to help individuals with disabilities participate fully in all aspects of society. We believe that individuals with disabilities should have as normal a life as possible and be able to do activities and work which address their individual interests and skills, to live in the community in the kinds of housing as same-aged peers, and to have the resources and supports to enable them to participate in personal, social and community activities. 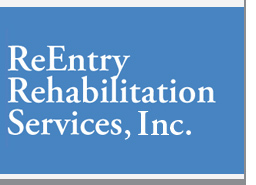 ReEntry Rehabilitation Services, Inc. is a private agency. We provide services we have been contracted to provide, on an individual, case-by-case basis. Therefore, we do not provide all services to all clients.